The story of BioEYES is an exciting one and exemplifies a true partnership between science and education. Dr. Farber may look like your typical scientist, racing in between his office and his lab full of graduate students and researchers, but he also has a tremendous amount of enthusiasm for getting young kids turned on to science. As a faculty member at Thomas Jefferson University in Philadelphia, Dr. Steven Farber opened up his laboratory and dedicated his time to the university community for tours. He also started volunteering in his children’s school to bring live science into their classrooms. 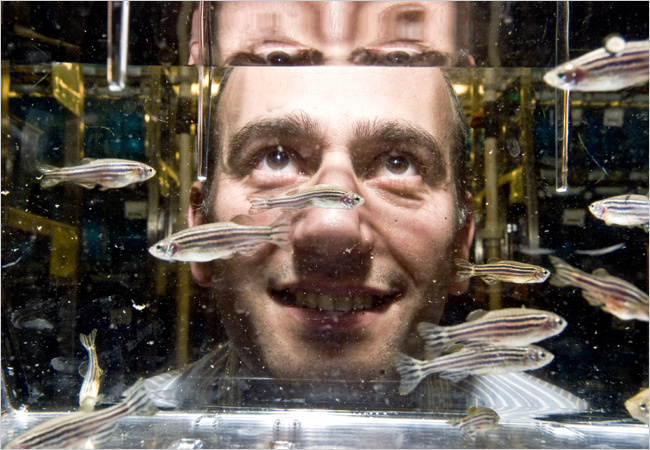 His tours and talks became the most popular stop at the university, in part because he works with zebrafish and his facility looks like an aquarium! It became apparent that Dr. Farber could really make a difference in how young people are exposed to science and ultimately careers in Science, Technology, Engineering, and Math (STEM) professions. As a result of the demand of his research and balancing it with the popularity of his outreach efforts, Dr. Farber hired Dr. Jamie Shuda, an educator, in 2002 to help develop his idea into a practical, fun, and educational program. With Dr. Farber’s science background and Dr. Shuda’s teaching experience, BioEYES was born. In its first year, BioEYES recruited teachers from the School District of Philadelphia to help develop and pilot the week-long classroom zebrafish experiment, called "Project BioEYES." The School District of Philadelphia immediately came on board, acknowledging the innovative experiments as a true complement to the National Science Standards and their curriculum. BioEYES was off and running. Over the next several years, Drs. Farber and Shuda talked about the program’s success at national science and education meetings. Articles in The Scientist, the Public Library of Science (PLoS), and The New York Times were written about the impact of BioEYES on young scientists. Soon the demand for the program far exceeded the amount of time they had. Fortunately, several local foundations such as GlaxoSmithKline and the Brook J. Lenfest Foundation provided support to grow BioEYES! Materials were developed, outreach educators were hired, and Drs. Farber and Shuda started disseminating BioEYES nationally! The program's success resulted in Drs. Farber and Shuda receiving the Viktor Hamburger Outstanding Educator prize in 2012 from the Society for Developmental Biology. A second curricula, "Your Watershed, Your Backyard," was launched in Baltimore, MD in 2008 with support from the Chesapeake Bay Trust. This program educates middle school students about stream water ecology and has students raise zebrafish embryos in stream samples collected on local field trips. So far, this program is only available in Baltimore, MD. Currently, BioEYES's outreach programs have reached more than 100,000 students in Philadelphia, PA; Baltimore, MD; South Bend, IN; Melbourne, Australia; and our newest center in Salt Lake City, UT. These programs are a grassroots effort formed by a scientist with an excitement for public education (sit next to Dr. Farber on a plane and you'll see! ), an urban educator who understands the needs of under-resourced schools, local teachers who not only value university-community partnership but are eager to learn themselves how to be scientists, and a team of dedicated outreach educators who bring these experiences into the classroom. As the demand for our programs grow, we hope to continue to expand on our success and develop new and exciting programs that reach students around the world.